Fig. 4-1-2-1 shows the number of cases and persons cleared for non-traffic penal code offenses committed by visiting and other foreign nationals (from 1980). The number of cleared cases for non-traffic penal code offenses committed by visiting foreign nationals started to exceed the number committed by other foreign nationals from 1993. In recent years, the number started to sharply increase from 2002, reaching a record high level in 2005, but then started to decrease, and was 12,582 in 2011 (down 10.3% from the previous year). The number of visiting foreign nationals cleared for non-traffic penal code offenses reached a record high level in 2004, but then started to decrease, and was 5,889 in 2011 (down 12.2% (id.)). 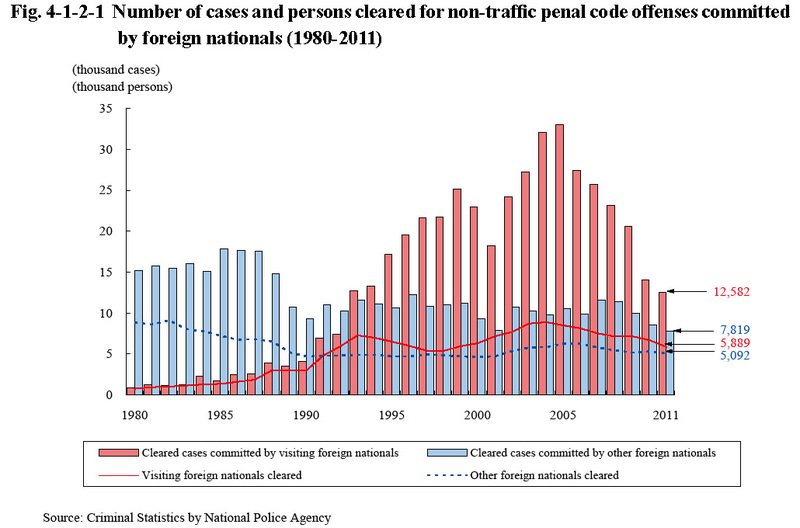 In accordance with the increase/decrease in the number of cleared cases committed by visiting foreign nationals, the number of cleared cases for non-traffic penal code offenses committed by foreign nationals, including other foreign nationals, reached a record high level of 43,622 in 2005, but then started to decrease from 2006, and was 20,401 in 2011 (down 9.6% from the previous year). The number of foreign nationals cleared increased from 1999, reached a record high level of 14,786 in 2005, but then started to decrease from 2006, and was 10,981 in 2011 (down 8.7% (id.)) (See Appendix 4-1). Foreign nationals accounted for 3.6% of the total number (305,951) of persons cleared for non-traffic penal code offenses in 2011. Fig. 4-1-2-2 shows the percent distribution of cleared cases for non-traffic penal code offenses committed by visiting foreign nationals by type of offense in 2011. 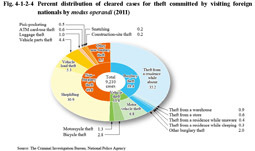 Theft accounted for the majority of cases at 73.2%. With visiting foreign nationals, the number of cleared cases per person cleared for theft was large at 3.01 when compared to that of the total persons cleared for theft (1.82) (See Fig. 1-1-2-2). Fig. 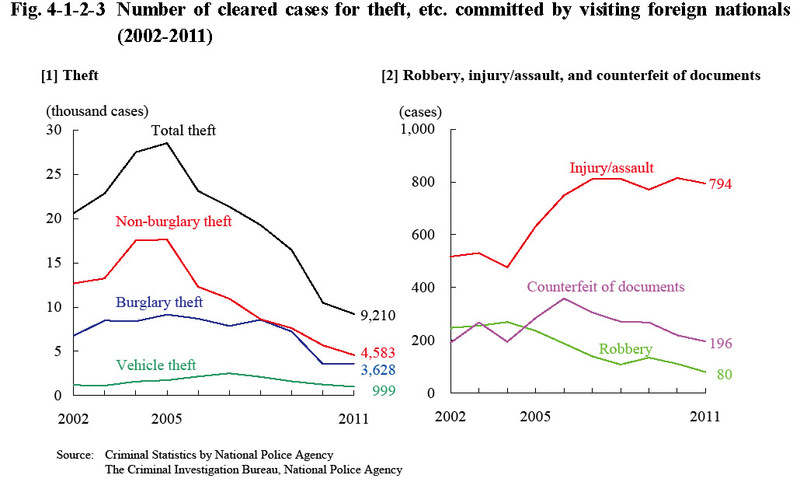 4-1-2-3 shows the number of cleared cases for theft, robbery, and injury/assault, etc. committed by visiting foreign nationals over the last 10 years. 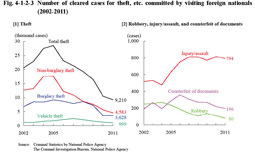 The number of cleared cases for theft reached a record high level in 2005, but then started to decrease from 2006, and was 9,210 in 2011 (down 12.1% from the previous year). The number of cleared cases for injury/assault was increasing over recent years, with the number in 2011 being approximately 1.5 times that of 2002. Fig. 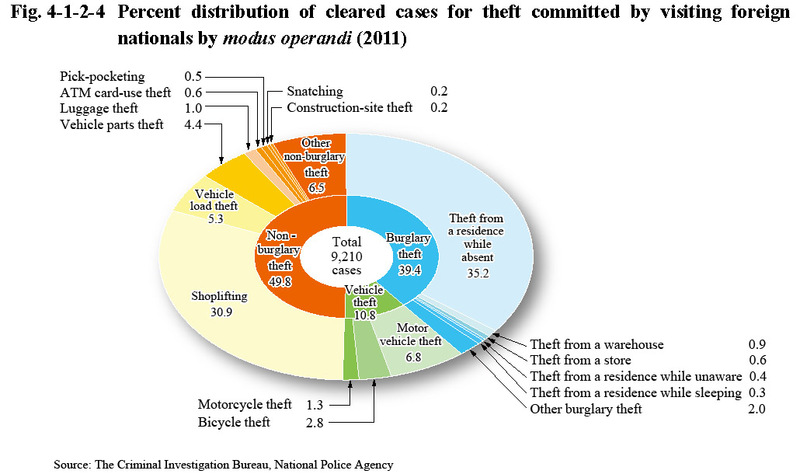 4-1-2-4 shows the percent distribution of cleared cases for theft committed by visiting foreign nationals by modus operandi in 2011. Theft from a residence while absent was the highest in proportion at 35.2%, followed by shoplifting, motor vehicle theft, vehicle load theft, and vehicle parts theft in that order (See Fig. 1-1-2-3 for the percent distribution of all reported cases for theft by modus operandi).